Belden 24/2P Low capacitance multi-conductor cable with 0.273-Inch OD, features 0.015-Inch thick flamarrest® low smoke polyvinyl chloride that jacket withstands daily wear and tear. This 0.019-Inch thick Teflon® foam fluorinated ethylene propylene insulation resists electrical leakage and offers protection against environmental threats. Cable has Beldfoil® tape aluminum foil polyester tape /braid tinned copper shielding that reduces EMI/RFI interference and helps to reduce crosstalk. Tinned copper cable has voltage rating of 300-Volts and current rating of 3.2-Amps. It has resistance of 24-Ohm/1000-ft, impedance of 120-Ohm and capacitance of 12 pF/ft. Cable has operating temperature rating of -20 to 75 deg C. It is ideal for computer and computer POS. 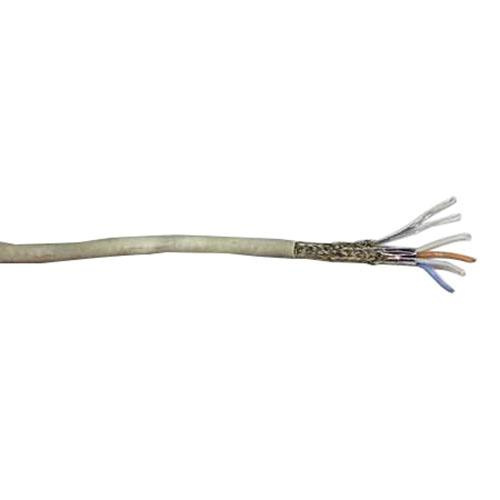 Cable is UL-cUL listed, CSA certified, CE marked, RoHS compliant and meets NEC standards.